For more than a year Julian had been asking Public Works Director Jim Ewing to fix situations that were dangerous for pedestrians. 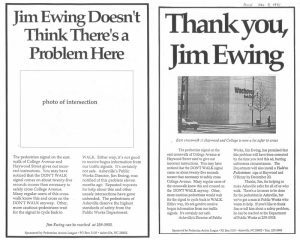 In a November 1991 letter he finally asked Ewing to respond to two particularly worrisome problems within 10 days. Again, no response. The day before Julian’s deadline, the problem was fixed. 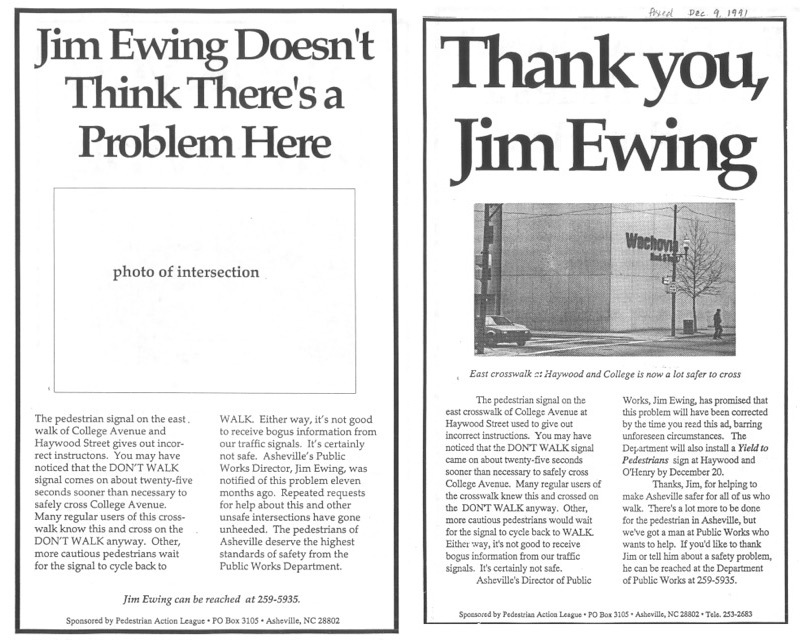 Except for fixing that one problem intersection, Ewing still either dragged his feet on issues or just didn’t respond. Julian began sending requests to then Traffic Engineer Bob McDonald, and cc’ing City Council members, City Manager Doug Bean, Assistant Manager Charles Penny, and others. The result: still little or very delayed response. A few weeks later Julian did get a response – this time from City manager Doug Bean who told Julian that his communication style was “somewhat threatening”, “destroys any working relationship” and could cause “community alarm.” This was the last straw. Julian wrote back with a six-page missive quoting letters he had sent over the last year with repeated polite requests for action for pedestrian safety, with appreciations for any action given, and offers to give staff assistance as they would like it. Sometimes a roadblock is an invitation to begin a whole new journey. Unwittingly, Bean encouraged Julian to take his complaints to a bigger audience. A few months after Bean’s letter, Julian began publishing CityWatch, which covered a wide range of topics, and gave a platform for other people who wanted changes in their neighborhoods and communities. Through the magazine, he encouraged others to speak up too, and to realize that the little things they cared about are important.